We were looking for something fun for the employees that would also benefit the company and be fair to everyone. We designed a contest called the “W.A.Y. To Go” contest. (W.A.Y. = We Appreciate You). This contest was inspired by Disney’s “Great Service Fanatic” card. There were 12 items on the list. 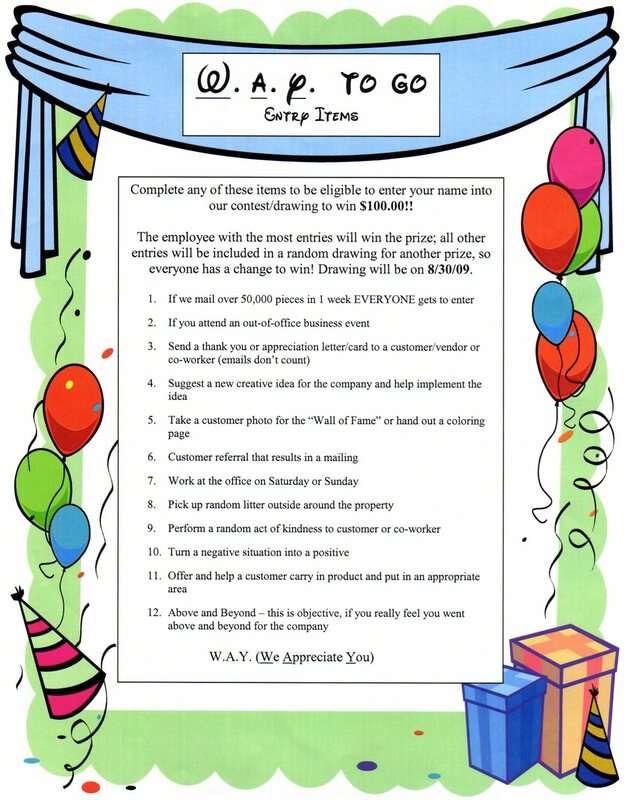 If an employee did any one of these they could enter their name in the drawing. In fact, they could enter as many times as they actually completed that item. They also could enter a co-workers name for them, if they felt they deserved it. There were two ways to win. The person that had the most entries won a prize and then there was a random drawing of all the rest of the entries for the second prize. Both prizes had the same value, so everyone had a fair chance. Random me: Sometimes I have so many creative ideas floating in my head that I get frustrated because I want to do them all.